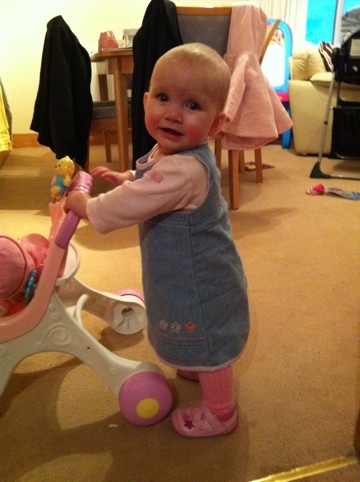 We reached a landmark for Emily a couple of days ago, her first shoes. She’s been standing for ages, cruising round furniture for weeks and trying to push her walker frames for about a fortnight, and her little pram shoes just weren’t giving her the support she needs. So, off we trotted to Clarks. Now, I remember this was incredibly exciting for us when we got Daniel’s first shoes. We did the whole posing for a Polaroid (which, by the way, have gone very downhill since Daniel was done three years ago. A small sticker with very poor resolution. Anyhoo…), deliberating over choice and choosing the cutest and best fitting pair. Being a boy, the colours were mostly dark blues, browns, etc and all shoes pretty much went with all his outfits. Oh, how different for a little girl! I had already looked ahead and seen some very pretty shoes in the “Cruising” range; although the ones we really wanted were “Crawlers” and not supportive enough. I wanted them to go with everything she had, to be pretty, not too bubblegum-my, and did I mention pretty? Sadly, because she’s a very young walker, her feet are still quite small and the only two styles that fit in the “Cruising” range were either a plastic-y, trainer-y sort of thing (no thank you, we’re not quite ready to do the Great North Run yet) or the ones we got. They’re in the photo. They’re also in black and white because they are a little bit TOO pink. Candy floss pink, not a nice raspberry or pale rose. Not really what I was after, but they fit. They also have helped her, she’s gained confidence in walking in just a couple of days. So I was silly to be upset, which I was. Just a little. The thing is, which possibly men (most men; I hesitate to generalise) don’t understand, is that shoes finish a girl off. The right shoes make you feel confident, help you walk taller, complete an outfit, complement your personality. Heck, they can even make you look slimmer (by helping your posture). A girl’s first shoes should be the magical start of a lifelong love affair. Sadly, my shoes were never any of those things. I have the most awful feet – long, thin and shallow. I was condemned throughout childhood and adolescence to have sensible shoes, black or navy with laces when I longed for pretty slip-ons or lovely buckles. The closest I came, I have no idea how old I was (9?10?) was a pair from Clarks. They were advertised on tv, with a little girl going through a secret doorway with a magic key, and the shoes had the key in the soles. I adored these, I think I walked on air when I managed to get a pair that fit. Then in no time I outgrew them. Adulthood has brought the freedom to ruin my feet with shoddily fitting shoes but alas, not the money to buy them with. So I still have to be sensible in my shoeshopping. Luckily, I thought, I now have a daughter. I can live out my shoe-love-life vicariously through her. What a beautiful photo of Emily. May she walk tall throughout her life. Platforms? Biker boots? *thud* Nooo! Pretty shoes! Aw that’s lovely Rachel, thank you! Oh my god I’ve had so many hissy fits over my daughter’s shoes too! And my little sister had those Clarks shoes with the key in the sole. Even though I was a teenager by that time, I coveted them – there were no pretty shoes in my childhood either, mostly sensible brown t-bars. It scars you for life, doesn’t it, the “sensible shoes” thing? I do hope Emily does get the pretty shoes; coupled with the melodramatic tendencies she’s already shown, the consequences could be disastrous for us all! I have big feet. And they’re wide. I also can’t walk in trainers very well any more, so heels are out of the question. One of my daughters shares my passion and I have drooled over the ones she now wears. I sadly remember the fights in Clark’s when she wanted Pods with three inch platforms for school while I wanted her to have sensible (but pretty) flats. I couldn’t affod both. I won but she sulked for weeks. I bought her the Pods as a birthday present and I’m sure she sneaked them into her school bag and swapped them on the bus! I hope you have many happy years of shoe shopping with your daughter. Miaou! I HATE trying to buy shoes for my paws! Wearable is never fashionable. There are some very cute shoes around for young human paws though. Loved this post. I have a link to a You Tube video of the advert for those shoes on my blog. I’m so jealous you had a pair, I had to have proper supportive shoes so wasn’t allowed. 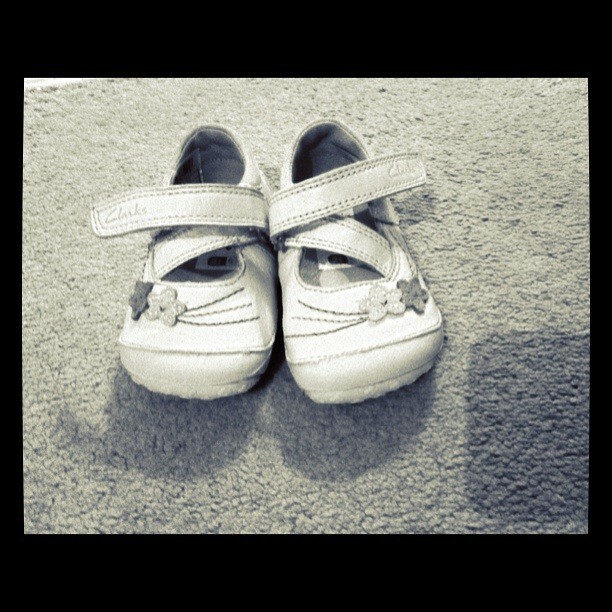 I think Emily’s shoes are proper cute though, my virtue of being so small. I sense a shoe scrapbook being something that you make together. Just noticed that this comment wasn’t approved for some reason, sorry about that. Wow, I can’t believe you have a video, need to see that again! They were my favourite shoes ever because it was the only time I did get a pair of nice shoes. And oh my! How much do I LOVE the idea of a shoe scrapbook! Genius, that woman! There are and I hope Emily will have no more problems with shoes. Thank you for commenting! 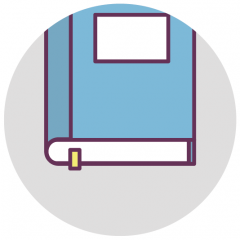 Previous Previous post: Book Review: You Choose!